To go with the lamb, I made a green lentil with cheese and tomatoes salad taken from the latest cookbook I bought, ‘Plenty‘ by Yotam Ottolenghi. The book is a treasure trove of inspiring vegetarian dishes using a wide range of vegetables, pulses, grains, etc combined together beautifully. Thank you Katia for recommending this book to me! Though everyone agreed that the salad looked beautiful in it’s bowl, not everyone was ready for the taste when we tried it! 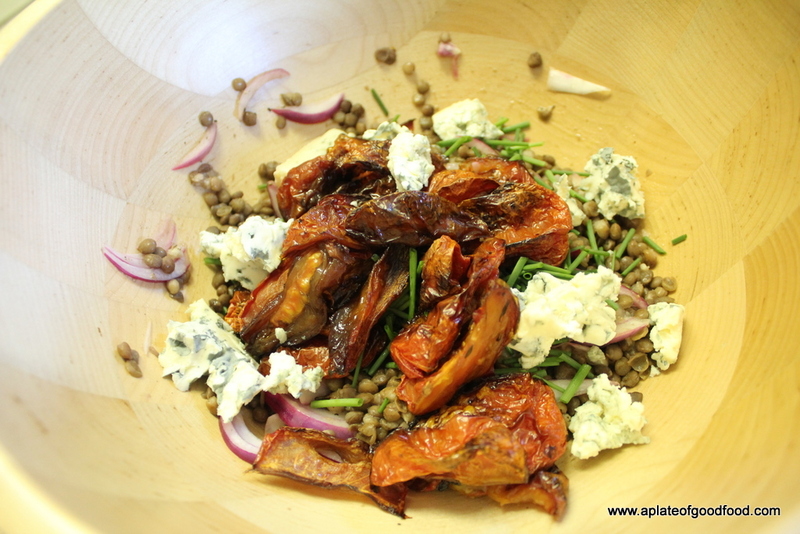 Each mouthful was a fusion of juices from the slow roasted tomatoes combined with the creamy saltiness of the cheese and bite from the lentils and onions. 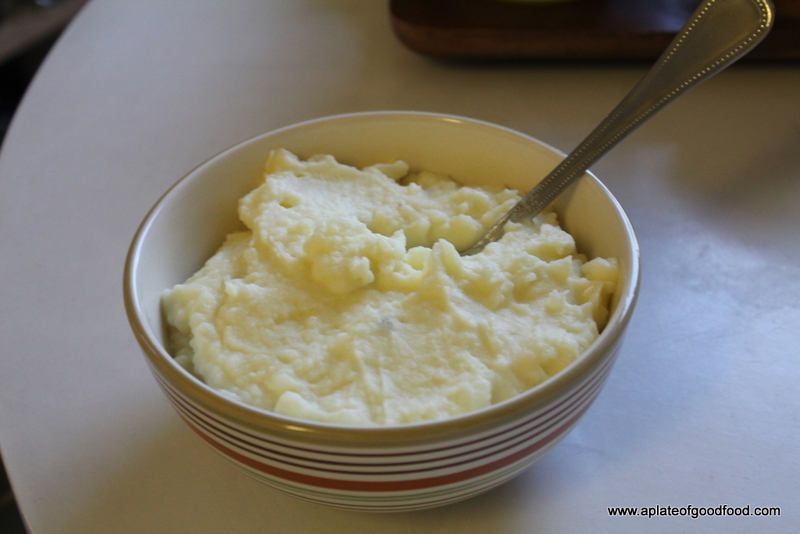 I also made a creamy potato mash as another side dish. For this, I used a Bill Granger recipe for coq u vin with creme fraiche mash. I did halve the ingredients required since I was making a smaller portion of mash than the original recipe. 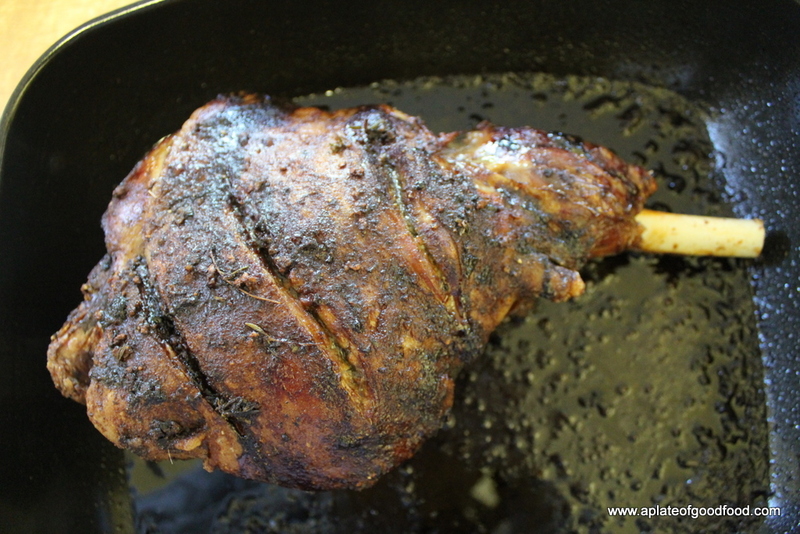 The roast lamb recipe is a Nigel Slater original that I found online (I think my lovely friend, Katia, shared this with me along with a couple of suggestions on how she makes the roast herself ;)). It’s truly an amazing find especially because it’s quite effortless once you source all the ingredients and the results are lip smacking good. *The original recipe calls for cumin seeds to be ground with the crushed garlic and other ingredients to make a paste. I used ground cumin and just stirred together all the ingredients. It also calls for a slice of butter to be melted and added to the spice paste. I usually omit the butter and add an extra tablespoon of olive oil instead. 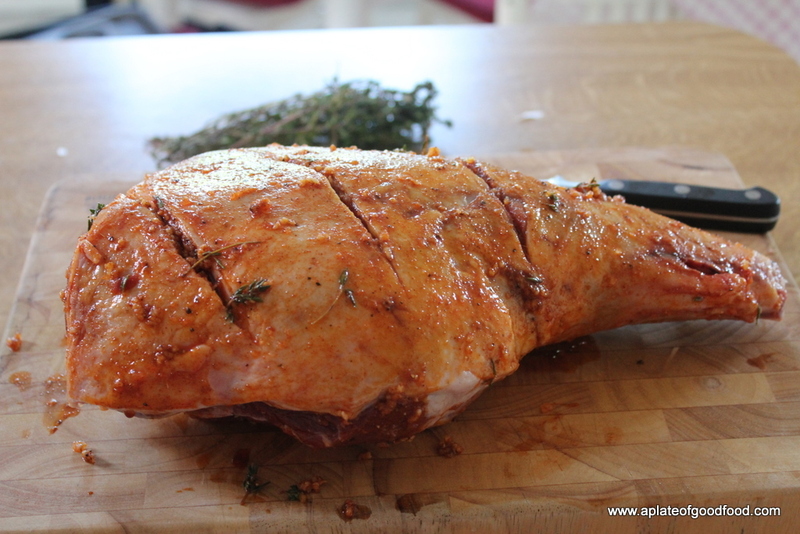 Apply the spice mix all over the lamb after making a few slashes in the meat so the seasoning penetrates better. 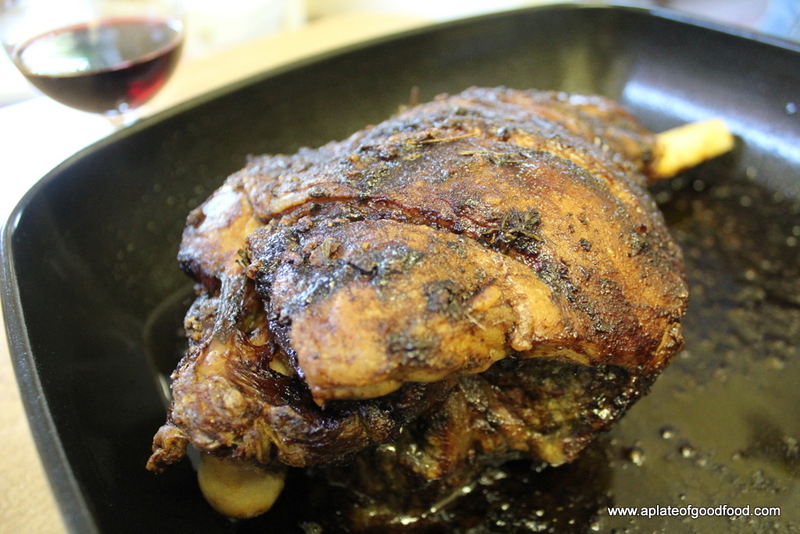 Place the lamb in a roasting tray. Based on my friend’s recommendations, I preheat the oven first to between 200-220 degrees Centigrade and roast the meat for an initial half hour or so. This initial blast of heat helps brown the outer surface. After half hour, reduce the temperature to 160 degrees Centigrade, add about a glass of water to the pan. Baste the meat with the liquid. I also cover the meat with some foil for the rest of the cooking period. Leave the meat in for at least 4-4.5 hours if not longer, basting it with the cooking liquids in the pan at one hour intervals. I still haven’t mastered the art of making gravy from roasting juices. Therefore, Peter stepped up and made some himself. After discarding as much as fat as possible, he deglazed the pan with some wine. After adding water to build volume, he strained the liquid and voila! the gravy was ready. As you can see, there are very few steps involved in the entire process. Pop in a piece of meat in a moderately hot oven and leave it in there for a few hours and you’re rewarded with a sumptious main for your meal that will never disappoint. 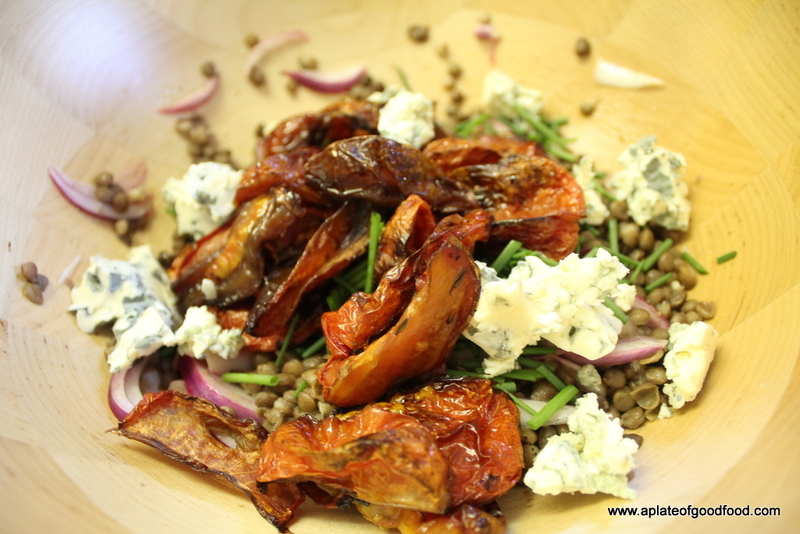 The original recipe for this requires Castellucio lentils which are similar to Puy lentils. I couldn’t find either at the supermarket, so I used a can of Bijoux Vert lentils that have the same consistency and texture as Puy or Castellucio lentils. Another variation I made was the cheese. Instead of going for gorgonzola as mentioned in the recipe, I used a milder blue cheese, bleu d’Auvergne, which worked fine as well. a handful of chives – the recipe also lists dill and chervil or parsley. I guess you could add any or all of these depending on what’s available. 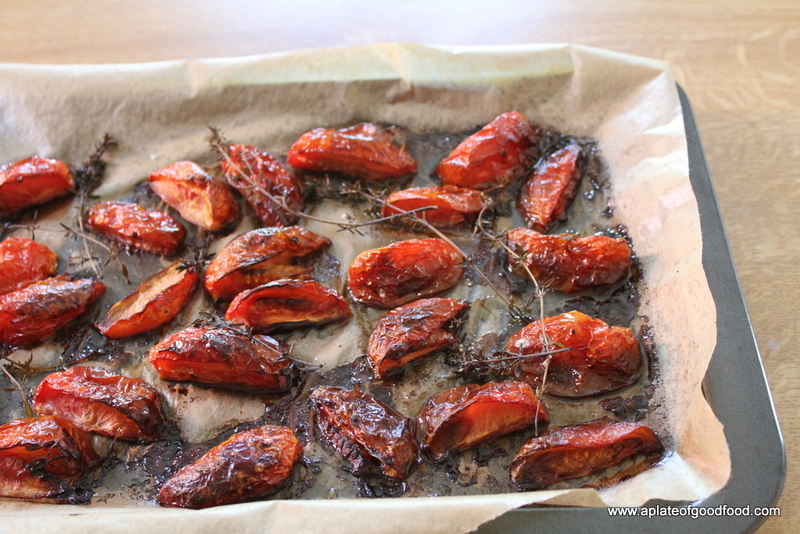 The first thing to do is to make the oven-dried tomatoes. Preheat the oven to 130 degrees Centigrade. Line a baking sheet. Cut the tomatoes into quarters each and place them cut side down onto the tray. Drizzle a tablespoon of olive oil and the balsamic vinegar. Season with salt. Spread the thyme sprigs over the tomatoes. Roast in the oven for about 1-1.5 hours. Add the vinegar and salt to the sliced onion in your serving bowl. Heat the lentils through in a pan filled with about a cup or two of boiling water on medium heat. This takes about 5-10 minutes. The lentils I used were precooked, however, if you’re using lentils that needs cooking, they need to be boiled for longer until cooked. Drain and let it cool for a bit. Then add this to the onions which should have softened a bit by now. Add the rest of the olive oil, pepper, garlic and herbs. Top it with the tomatoes and cheese cut into chunks. Toss everything together and serve. 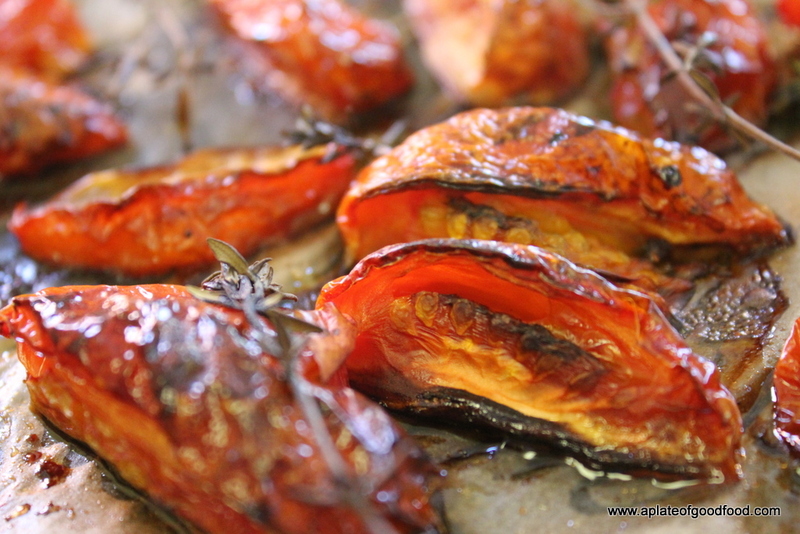 Except for the time taken to prepare the tomatoes, I felt this was a simple recipe that produces a non-fussy, flavoursome side dish. It also complemented the lamb better than I’d originally thought. All of this scrumptious food was aided with some good wine and slices of home made brown bread that Peter had so keenly baked in the morning. Nothing like good food with good company. Here’s a toast to many more such gatherings, cheers! I can personally vouch for the green lentils and the lamb – both were classics! Thanks da! Thanks for the comments da :)…am glad you’re enjoying your whirlwind tour of Europe…and am sure you’ll love Paris :D..come back soon!